Ninety-six children were killed in Aleppo, Syria, in the week between August 13 and August 19 this year. You will remember seeing the horrific photo of little Omran Dashneeq (pictured below) following airstrikes in Aleppo last week. According to UNICEF, over 80 per cent of Syria’s child population has been affected by the conflict. 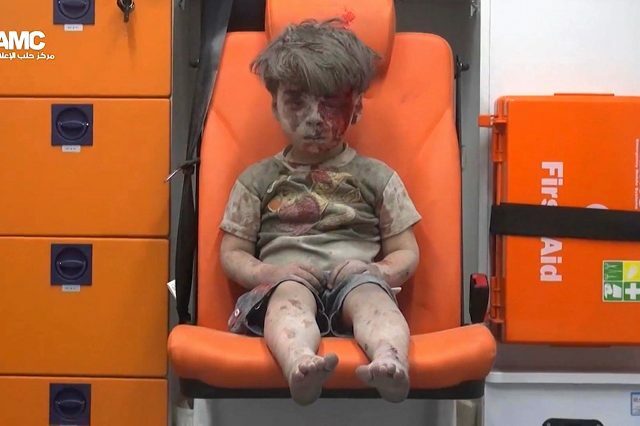 The doctors who treated Omran were shocked at how the world had only just noticed the plight that Syrian children were suffering when the war had been going on for over five years, The New York Times reported. 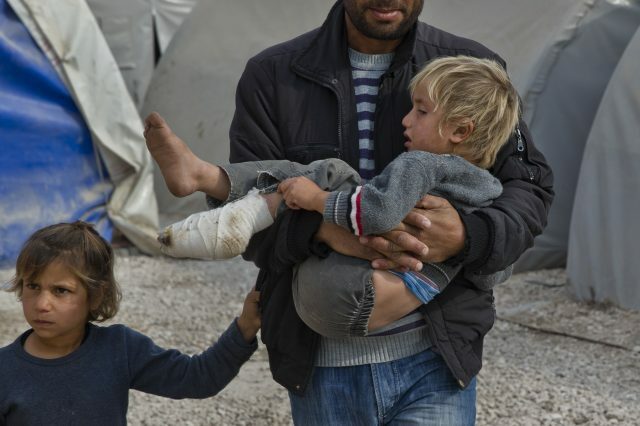 The photo below shows a Syrian Kurdish refugee man from the Kobani area carrying an injured child at a camp in Suruc, on the Turkey-Syria border on Sunday, November 16, 2014. Kobani had been under assault by extremists of the Islamic State group since mid-September 2014. There are hundreds of photographs documenting the many fatal airstrikes that Syrian civilians have suffered. But mainstream media has only exposed us to a small handful. The harrowing photos of the children above were all taken in the same hospital that Omran was treated in. These other children, some as young as seven-months-old, were wounded in the same airstrike in Aleppo. In July, there were airstrikes against the so-called Islamic State in the city of Manbij, Syria. Below are some photos showing how people tried to save children from the attacks. It is estimated that 11 children were killed on July 21 in Manbij. Aleppo was home to the most recent and horrifying airstrikes at the hands of both rebel and international forces. Russian airstrikes on Syria were reported to have taken place in Aleppo last Wednesday, the BBC reported. The little girl below was photographed in a makeshift hospital after shell attacks and air raids in the rebel-held area of Douma, east of the capital Damascus. Just because these photos aren’t being thrown in our faces by viral media, it doesn’t mean the issues don’t exist. It’s important not to forget about the greatest humanitarian crisis of our time.